This was a recipe I created a year ago for a Food52 ice cream contest. I surprisingly made it to the semifinals (call it beginner’s luck) but lost out in the final week of voting. That being said, this recipe is killer for fall time. It’s the perfect blend of fall ingredients mixed with those warm flavors of chai tea and vanilla. Enjoy! Preheat oven to 400 degrees F. Cut the squash in half; remove seeds and membranes. Place cut side down on a baking sheet and roast for 40 minutes until soft when pierce with fork. Let cool slightly. Scoop the flesh into a food processor and puree until completely smooth. 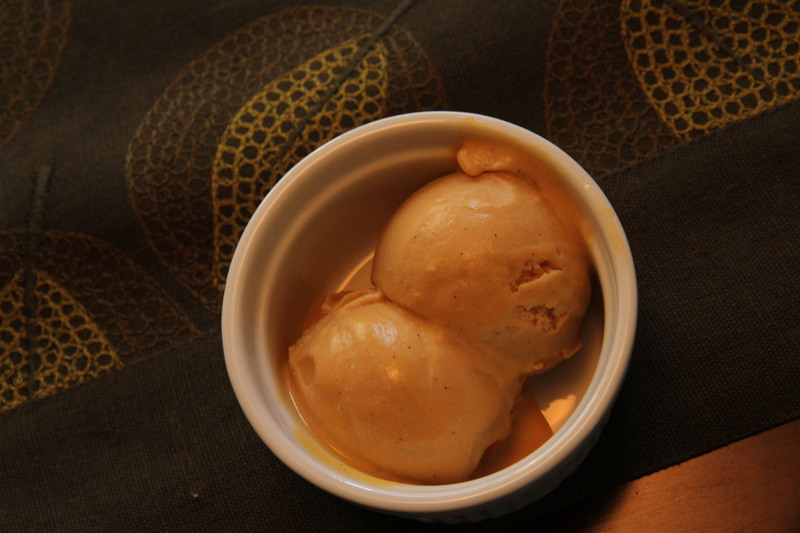 Measure out 1 cup of the kabocha puree for the ice cream; reserve the rest of the puree for another use. Combine first 5 ingredients in medium saucepan. Mash slightly with a wooden spoon. Add in whole milk and place over low heat. Simmer for 20 minutes. Remove from heat and place tea bags in milk mixture. Let steep for 10 minutes. Remove tea bags and strain mixture. Measure 2 cups of the chai milk mixture for recipe; discard remaining milk. Mix 2 TBSP of chai milk base with cornstarch in a small bowl to make a smooth slurry. Whisk the cream cheese and salt in a medium bowl until smooth. Add kabocha puree and maple syrup and combine until smooth. Combine the remaining milk, cream, sugar and corn syrup in a 4-quart saucepan, bring to a rolling boil over medium-high heat and boil for 4 minutes. Remove from the heat and gradually whisk in the cornstarch slurry. Return the mixture to a boil over medium-high heat and cook, stirring until the mixture is slightly thickened, about 1 minute. Remove from heat. Gradually whisk the hot milk mixture into the cream cheese mixture until smooth. Pour the mixture into a 1-gallon Ziploc freezer bag and submerge the sealed bag in the ice bath. Place ice bath in the refrigerator and leave for at least an hour, or preferably overnight. Pour the ice cream base into the frozen canister and spin until thick and creamy. Pack the ice cream into a storage container, press the sheet of parchment directly against the surfact, and seal with an airtight lid. Freeze until firm, at least 4 hours.